Dermatology in dogs has attained great heights in both diagnosis and management during recent years. Demodicosis or Red Mange is one of the common skin problems in dogs from one month to eight years and in almost all breeds, most common in Pugs and German Shepherds. Here’s more on Red Mange. Mange are cigar shaped mites, transmitted to the puppies on the 2nd to 5th day through milk. Normally all dogs do have mites, they flare up due to over growth when the immune status of your pet is down. They do not spread through contact. In some dogs, it runs in families, which means you should neuter these dogs. Localised Demodicosis causes minor local skin lesions whereas generalised Demodicosis affect majority of the body parts. These mites lead to loss of hair, reddening of skin (that’s why it’s called Red Mange) crusts, scabs, ulcers, itchiness, lethargy, fever. Sometimes the mites affect the legs causing pododermatitis. Take your dog to your vet when you notice a hairloss that is unresolving for more than two weeks. Never self-medicate or apply steroid creams without a diagnosis. If the lesions are suggestive of Mange, then your vet will take a deep scrapping from the skin lesion for demonstration in mineral oil – the live wriggling mites under a microscope. Demodex sp is the mite that lives in the hair roots and is responsible for such mangey skin. They are not visible to the naked eye. Red Mange is 100 percent curable, but dogs with recurrent lesions should be checked for hormonal involvement too. Localised lesions sometimes resolve by themselves as the puppies grow or respond to Amitraz applications. (Take care that dogs don’t lick applications.) Generalised lesions may require Ivermectin or Milbemycin on dosages and time that depend upon the severity of lesions and your vet’s decision. Consult your vet regarding the neurological side effects in case of toxicities of Amitraz or Ivermectins. If you follow your vet’s instructions on giving pills and applications methodically, your dog will get back to normal skin and coat. Feathered silky flowing red hair, dark hazel expressive eyes, muscular legs, proportionate bodyline, athletic with sweet temperament… the Red Setters have it all! His beautiful looks and high energy will bring joy to your family. Here’s some more info about this lovely breed. Red is the colour of energy, courage, strength, vitality, and passion and Irish Setters, better known as Red Setters, live upto the colour of their coat. Perhaps the most beautiful of all breeds, Irish Setters simply take your breath away with their beauty and grace. Originally called the Irish Red Setter in US, they are the ancestors of Spanish Pointer. He was bred as all-around hunting dog, with strong sense of smell. Fast and racy, he was particularly good for hunting game birds. His beautiful looks and sweet disposition has made him a show and a family dog. The aristocratic Irish Setters have feathered, long, silky red-coloured coat, except for the head, where it is short and fine. Even his feet are well covered with hair. His long ears are triangular and soft while his legs are long and muscular. He is slightly longer than tall, giving an overall look of elegance and strength. Other features include black or brown nose and chestnut or dark hazel eyes, giving an expression of softness, yet alertness. Do not be betrayed with their melting brown eyes as they will make you to give in to their demands. His tail is fringed. Their colours range from rich chestnut with no trace of black. They can have a little white on chest, throat, chin or toes, or small star on forehead or narrow streak or blaze on nose or face. As per Nagendiran Reguraj, a reputed breeder of Irish Setters, their best physical appearance is their chestnut colour and shiny coat. The height of the male dogs is 26-28 inches and weight 29-34 kg while that of female dogs is 24-26 inches and 25-29 kg, respectively. They have a life expectancy of 11-15 years. Irish Setters are very affectionate, friendly and intelligent. Besides, they are quite active, full of energy and high spirits. They are swift, with an excellent sense of smell. It is a treat for eyes to see them walk as their gait is lively and graceful. As per Reguraj, “Irish Setters are racy, balanced and full of quality.” They are responsive and impulsive, yet sensitive and are a real joy to be around. They love to be around people and are excellent with children. They also like to play with other dogs. By nature, Setters have a mind of their own and need lot of love and attention. They are very clever dogs, which makes it more difficult and challenging to train them. But once trained, they remain trained for the rest of their life. They make good companions, are lovable and need lots of exercise. They are not recommended for apartment living and need a yard to run around. They need plenty of exercise in open spaces. They love to play games like retrieving, swimming and other fun games. Shower lots of love and care. Be patient and never be aggressive while training and upbringing your puppy, advises Reguraj. “The more love you give, the more you get,” he added. Grooming an Irish Setter is easy. Daily brushing and combing keeps soft coat and make him look his gleaming best. They are an average shedder. They tend to bloat, hence it is advisable to feed them 2-3 small meals instead of one big one. 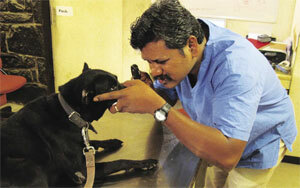 They are also prone to eye problems, elbow and hip dysplasia. Ears should also be carefully groomed to avoid ear inflammation. “Irish Setters are not for everyone. Don’t bring home a Setter unless you’re willing to match your wits and energy with these lovable, hyper-active dogs. And you’d better have loads of patience – teaching a Setter sit –stay–heel will test your patience to the limits. The Setter tries to wear you down; to make you do his bidding! With a Setter you’ve to show who’s the boss – not with anger but with firmness. And believe me, there are times when you just want to give in, to let him do as he wishes. But at the end, patience pays. Firmness is what the Setter demands and finally respects. And once you’ve mastered that, you’ll have the best companion that you could ever want. Sure, you can never expect the Setter to be predictable…but then what’s life without a few surprises?” told Adite Chaterjee a proud pet parent of Irish Setters.